The Design Studio guides students through a creative problem-solving process as they invent innovative solutions to a specific sustainability challenge, such as reducing campus energy consumption, improving public transportation or increasing community access to healthy food. Students explore how a given challenge impacts the environment and community, analyze stakeholder viewpoints and assumptions, and begin to define the ultimate goal and purpose of a project. Students consider how design and innovation can be used to engineer creative challenges to complex problems. Students brainstorm to cultivate new ideas, stimulate creativity, and begin designing their innovative solution. Students evaluate the strengths and weaknesses of their proposed solution, share and receive feedback, and refine in order to improve. 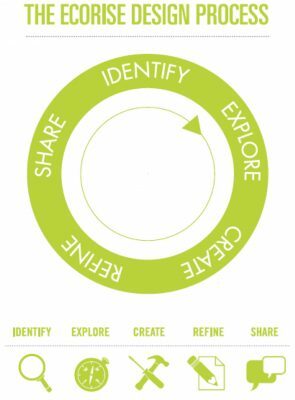 Students learn how to share their work in a compelling and relevant way, seeking to engage and empower their community through their design. 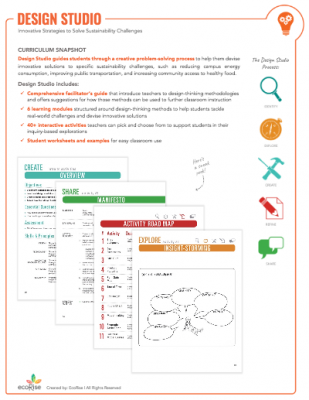 Click to enlarge and download the Curriculum One-Pager.